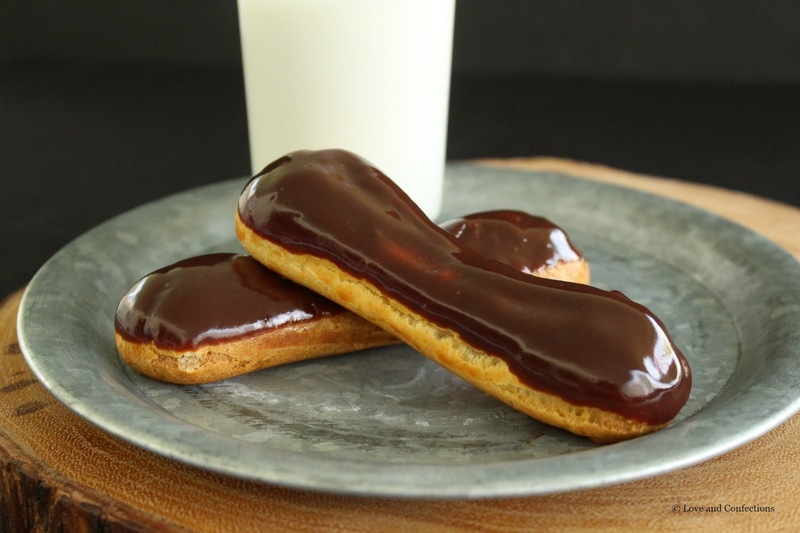 Chocolate Eclairs are one of my favorite pastries, with vanilla bean pastry cream and chocolate glaze. I created these delicious beauties for National Dairy Month with Florida Dairy Farmers and Sunday Supper. One of the things I often ask people I meet is “what is your favorite dessert or pastry?” As a pastry chef, I love knowing what sweets other people like. When asked about mine, I don’t really have a favorite, but eclairs are definitely at the top of the list. Pastry cream is one of my favorite things to make. It’s amazing how milk, sugar and eggs, and a few more ingredients, can be transformed into something so rich and delicious. I am partnering with Sunday Supper and Florida Dairy Farmers because June is National Dairy Month. For generations, Florida’s more than 130 dairy farming families have remained true to their values & committed to producing a fresh supply of wholesome, quality milk. These hardworking men & women are caretakers of their cows, stewards of the land, & leaders in their communities. I have never been able to visit a Florida dairy farm, but hope to one day, so I can see what it’s like to be on a Florida dairy farm and meet the farmers. The state’s more than 130 dairy farms are primarily owned and operated by second and third-generation farmers. Most of the dairy cows living in Florida are Holsteins – the black and white cows. Lafayette and Okeechobee are Florida’s leading dairy counties and most Florida dairy herds range in size from 150 cows to 5,000 cows. With all those cows, Florida dairy farmers recycle about 170,000 tons of byproducts such as citrus pulp, brewers’ grain and whole cottonseed that are consumed by the cows instead of ending up in landfills. There are about 123,000 dairy cows in Florida that collectively produce about 2.34 billion pounds of milk a year. The total represents 277 million gallons of Florida-produced milk in the grocery store. I absolutely love dairy, and we enjoy it every day. #ToddlerLnC starts her day with a sippy of milk, and I use milk in my morning cup of coffee. We use milk in smoothies and other recipes for lunch or dinner. Three cups of milk a day is recommended to get your daily allowance for dairy. Milk contains 9 essential nutrients and vitamins: protein, vitamins A, D, and B12, calcium, potassium, phosphorus, riboflavin, niacin, zinc, and magnesium. Did you know that each Florida dairy cow produces about 6-8 gallons of milk each day and is milked 2-3 times per day? You can find out more about Florida Milk in the kitchen, in schools, and in the news at these links and by following them on Facebook, Twitter, YouTube, Instagram, and Pinterest. 1. In a stainless steel pot (not aluminum) heat Milk and first measure of Sugar until sugar is dissolved and the milk is hot but not boiling. 2. In a medium bowl, whisk together the Egg Yolks, Sugar and Cornstarch. Temper* milk mixture into yolk mixture. 4. Strain the pastry cream through a fine mesh sieve into the bowl of your stand mixer and beat on the lowest speed. Add in the Butter and Vanilla Bean Seeds or Paste after it has cooled for a few minutes. 5. Pour into a clean medium-sized bowl, cover with plastic wrap directly on the surface and allow it to cool to room temperature before storing in the refrigerator. 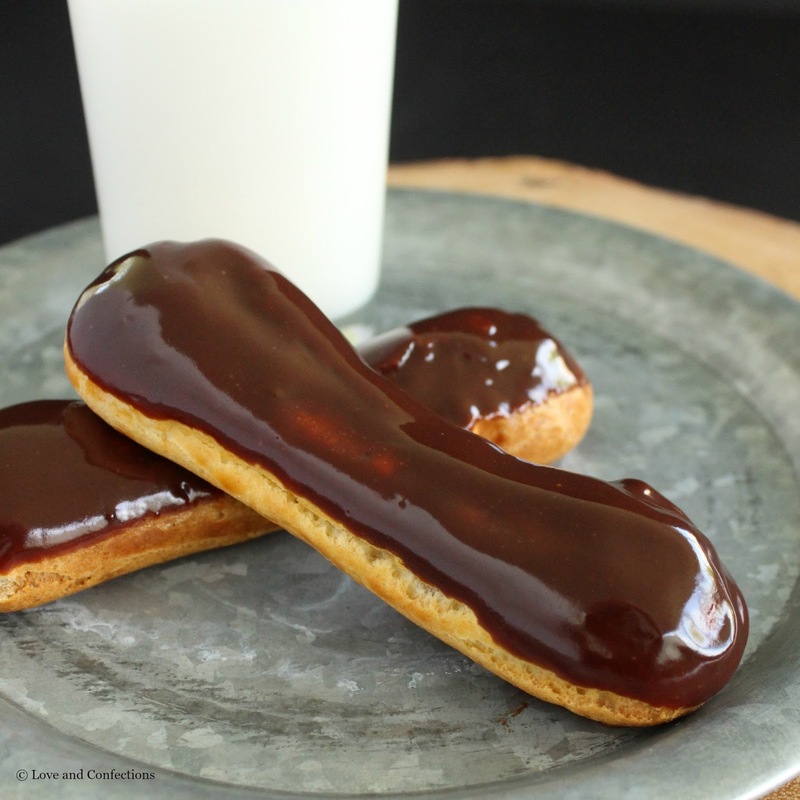 – It is best made the day before the Pate a Choux, so it has time to fully chill. 1. Heat oven to 400F. Prepare sheet pans with parchment or silicone mats. 2. Bring the Milk and Butter to a boil. Add in Flour, Salt and Sugar and cook on medium-high, stirring constantly with a wooden spoon, until a paste is formed. The mixture should form a ball or leave a film on the bottom of the pot. 3. Remove from the heat and place in the bowl of your stand mixer with the paddle attachment. Beat on low for a minute then add in the eggs, one at a time, making sure the previous one is incorporated before adding the next one. 4. Once all the eggs have been added and the mixture is a bit cooler, put in a piping bag fitted with a large circle tip. Pipe strips of choux on the sheet pans, trying to not create a point when lifting off. 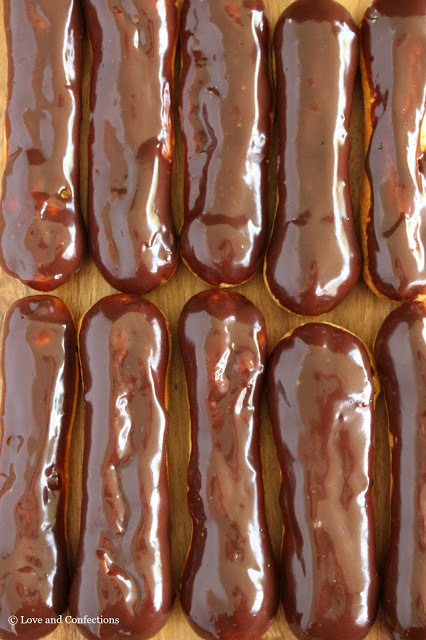 Using a pastry brush, or your fingers, gently brush the egg wash over the eclairs, trying to make sure there is no point sticking up. 5. Bake at 400F for 5 minutes, then turn the oven down to 375F for the remaining time. It should take about 30 more minutes, or until the puffs are dry and golden brown. Do not crowd the oven. You might need to bake these in two batches. 6. Let them cool completely before filling. 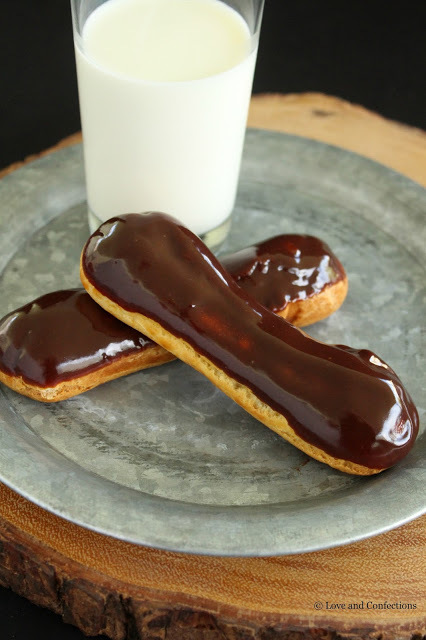 To fill, gently pipe the pastry cream into the eclairs. Refrigerate or freeze until glaze is done. 1. Place chocolate chips in a medium bowl. Heat Heavy cream and corn syrup in a small saucepan until it just starts to boil. 2. Pour the hot cream over the chips and let it sit for a minute. Whisk the chocolate and cream to make a ganache. 3. Gently dunk each eclair into the glaze and shake off any excess. Place onto baking sheet or serving tray. Chill until serving. Can be made ahead and chilled. *Tempering: eggs are tempered when a hot liquid, usually milk, is slowly streamed into them, while whisking constantly, to bring the eggs up to a warm temperature without cooking them. **Nappe: French term referring to a liquid “coating the back of a spoon”. With pastry cream, if you run your finger through the (hot) pastry cream on the back of a wooden spoon, the lines will stay separate. Disclaimer: This post is sponsored by Florida Dairy Farmers in conjunction with a social media campaign through Sunday Supper LLC. All opinions are my own. Oh…I learned something new. Nappe! I never knew what that was called. Great looking recipe and perfect one to make with milk! 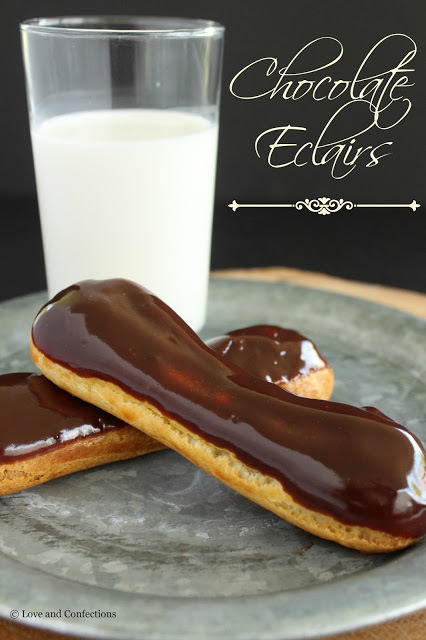 These eclairs look absolutely perfect. I would gobble these up in a heartbeat!